We have heard several rumors regarding OnePlus 5 which is the successor of previous year’s OnePlus 3 and OnePlus 3T. 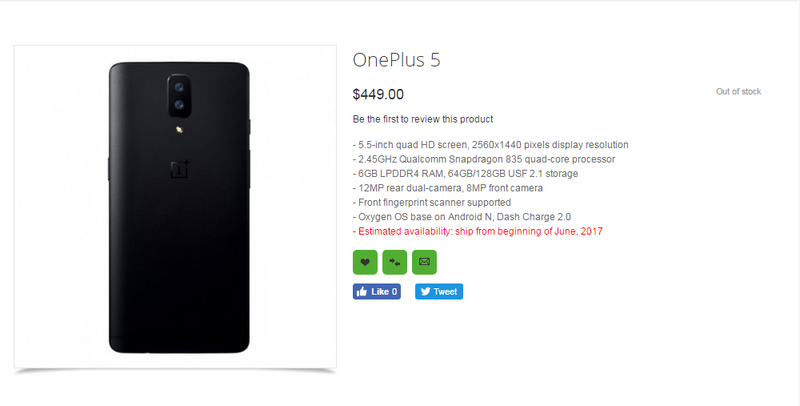 Recently, OnePlus 5 has been spotted on a mobile retail website called OppoMart. Well, high-end smartphones have already started to arrive on the market. Recently, Samsung launched Galaxy S8 and Galaxy S8+ and Xiaomi introduces Mi 6 which was the second smartphone to feature Snapdragon 835 processor. Well, we are yet to see flagship smartphone from OnePlus. Previously, we have heard several rumors regarding OnePlus 5 which is the successor of previous year’s OnePlus 3 and OnePlus 3T. 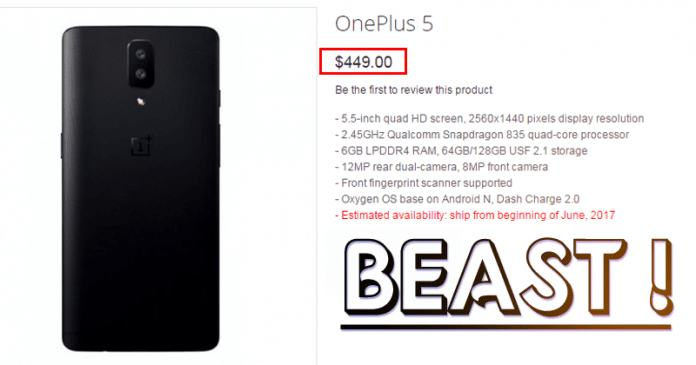 Recently, OnePlus 5 has been spotted on a mobile retail website called OppoMart. Well, the listing reveals a dual rear camera setup and the price of the phone is $449 (Rs 28,800). However, the price is hard to believe because the OnePlus 3T(64GB) already costs Rs 29,999 in India. Well, OnePlus 5 will undoubtedly be more powerful, it’s likely to cost more as well. The listing also reveals that the phone will feature a huge 5.5-inch Quad-HD display which will share the resolution of 2560×1440 pixel. The device will run on Snapdragon 835 process and will have 6GB RAM. The phone will be available in two internal storage variant 64/128GB. The phone will feature 12megapixel rear dual-camera along with 8 Megapixel front camera. The phone will be running Oxygen OS based on Android Nougat. So, what do you think about the listing? Share your views in the comment box below?